Remove the left camshaft cover. Refer toCamshaft Cover Replacement - Left Side.Remove the left intake and exhaust camshaft position sensors. Refer toCamshaft Position Sensor Replacement - Bank 2 (Left Side) IntakeandCamshaft Position Sensor Replacement - Bank 2 (Left Side) Exhaust.Remove the left intake and exhaust camshaft position actuator solenoids. Refer toCamshaft Position Actuator Solenoid Valve Solenoid Replacement - Bank 2 (Left Side)IntakeandCamshaft Position Actuator Solenoid Valve Solenoid Replacement - Bank 2 (Left Side)Exhaust. 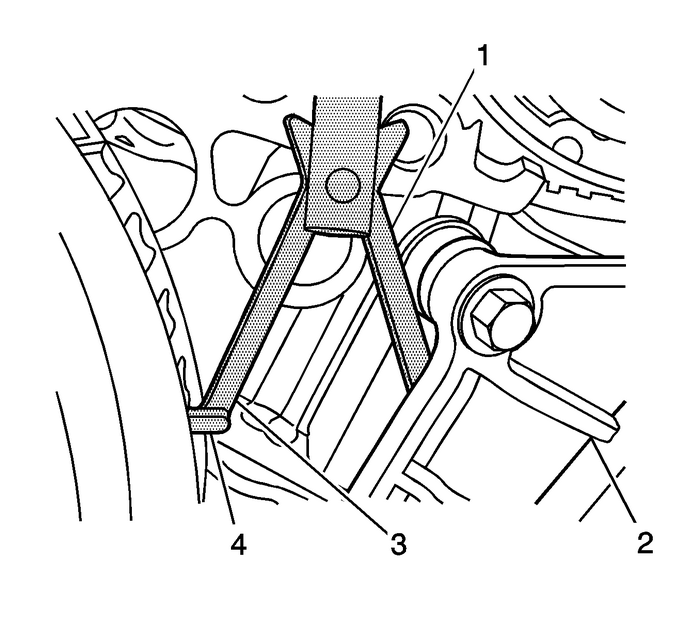 Note:Rotate the crankshaft balancer bolt in a clockwise direction ONLY. Rotate the crankshaft balancer using the balancer bolt until the camshafts are ina neutral (low tension) position. The camshafts will be parallel with the camshaftcover rail-(1). 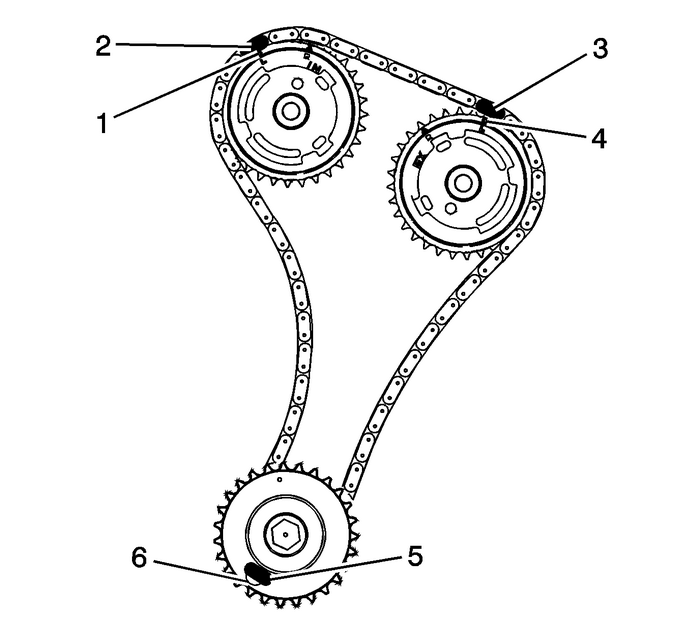 Note:Ensure that the camshaft timing chain and the camshaft position actuators are markedfor proper assembly. 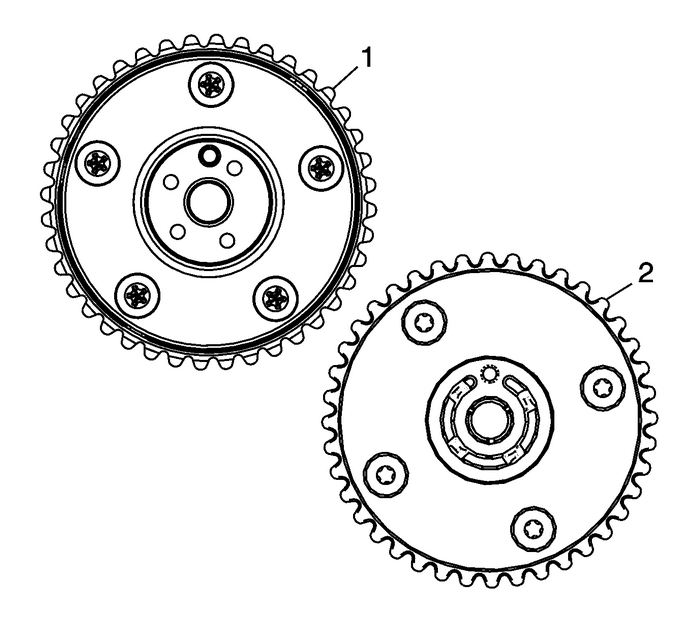 Use a paint stick to create an alignment mark on one of the timing chain links-(2)and the adjacent tooth on the exhaust camshaft position actuator-(1).Use a paint stick to create an alignment mark on one of the timing chain links-(3)and the adjacent tooth on the intake camshaft position actuator-(4). 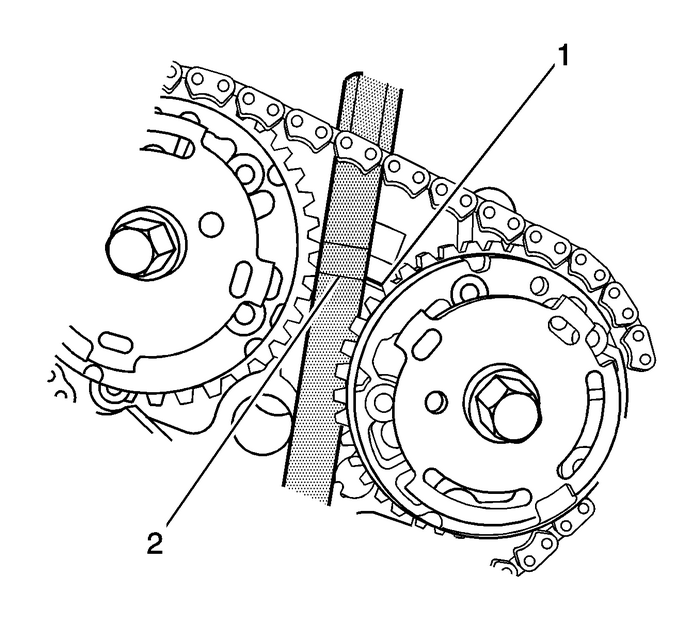 Caution:Refer toTorque Reaction Against Timing Drive Chain Caution. 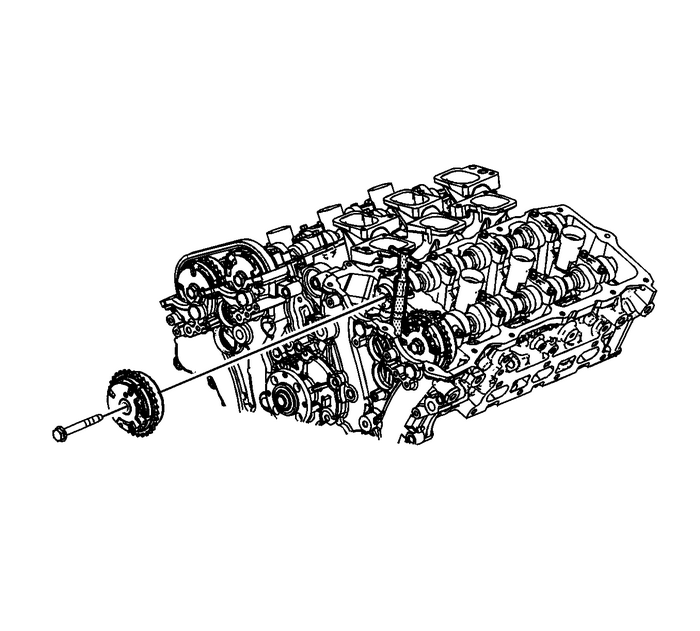 Use an open end wrench on the hex cast into the left intake and exhaust camshaftsand rotate the camshafts toward each other in order to create slack in the chain betweenthe actuators. 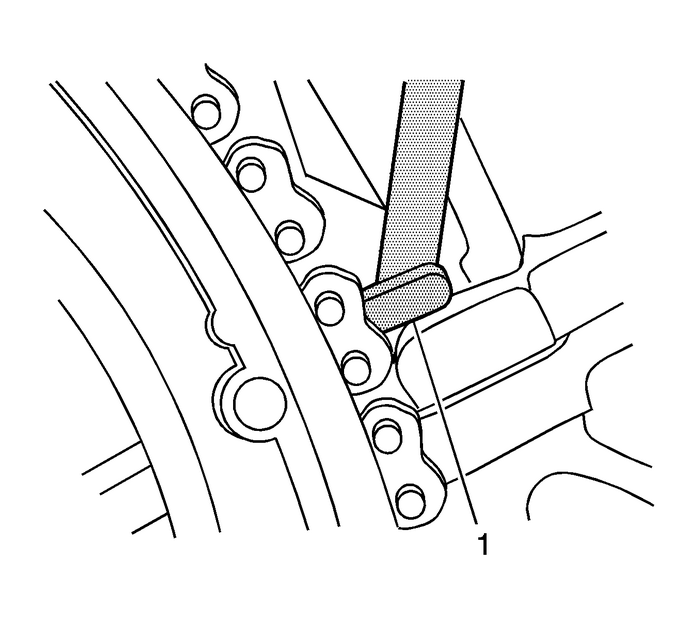 Unscrew the EN-48313 tool so that the legs of the tool are retracted.Insert the EN-48313 tool between the camshaft actuators, rearward of the timing chain until the bottom linethat is scribed in the body of the tool-(2) is adjacent to the top surface of thecylinder head-(1). This is the approximate installed position. Note:The engine front cover is removed for clarity in the following graphics, but NOT requiredto perform the procedure. 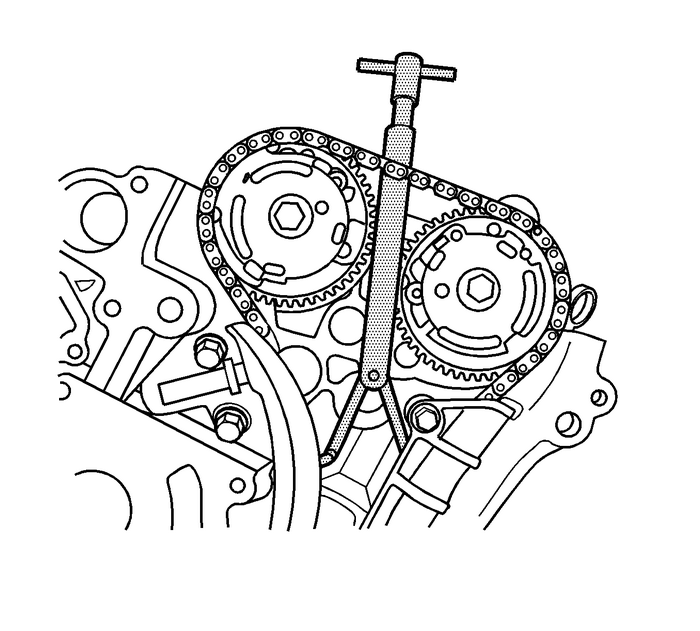 Ensure that the feet (4) on the legs of the tool are facing the front of the engine.Partially expand the legs (1, 3) of the EN-48313 tool by turning the T-shaped handle clockwise.Insert the leg of the tool (1) behind the timing chain guide-(2).Continue expanding the EN-48313 tool until the legs-(1,-3) contact the timing chain. Do not tighten at this time. Note:Ensure that the foot (1) of the EN-48313 tool is engaged into one of the link pockets to prevent tool slippage during tighteningof the EN-48313 tool. Hand tighten the EN-48313 tool.Use an open end wrench on the hex cast into the left intake and exhaust camshaftsand rotate the camshafts toward each other in order to create slack in the chain betweenthe actuators. The EN-48313 tool is now properly installed to hold the timing chain in position. Align the exhaust camshaft actuator alignment mark-(1) to the timing chain alignmentmark-(2) made during disassembly.Ensure that the intake camshaft actuator alignment mark-(4) and the timing chain alignmentmark-(3) are also aligned.Position the exhaust camshaft actuator to the camshaft and install the actuator bolthand tight.Remove the EN-48313 tool. The camshaft position actuator will vary depending on application.Camshaft thrust washers must only be installed on applications that had thrust washerspresent during removal of the camshaft position actuators. Do not install washerson applications if they are not already present.If equipped, ensure the proper camshaft thrust washer is used. Use a 1.6-mm (0.063-in)thrust washer on applications that have 5-attaching screws on the back side of thecamshaft position actuator-(1). Use a 1.1-mm (0.043-in) thick thrust washer with yellowspeckles on applications that have 4-attaching screws on the back side of the camshaftposition actuator-(2).Install the thrust washer, if applicable. If the exhaust camshaft position actuator has been replaced, then tighten the boltto 58-Y (43-lb-ft).If the intake camshaft position actuator has been replaced, then tighten the boltto 58-Y (43-lb-ft).If both the exhaust and intake has been replaced, then tighten bolt to 58-Y (43-lb-ft).Install the left intake and exhaust camshaft position actuator solenoids. 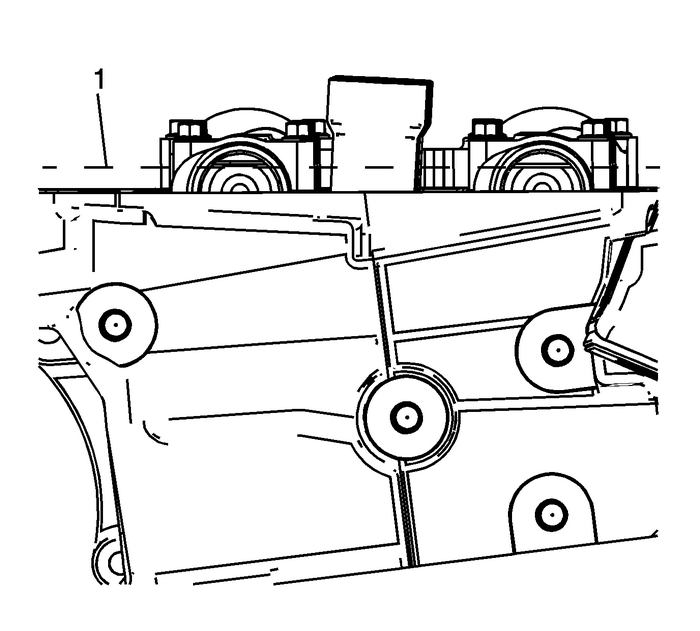 Refer toCamshaft Position Actuator Solenoid Valve Solenoid Replacement - Bank 2 (Left Side)IntakeandCamshaft Position Actuator Solenoid Valve Solenoid Replacement - Bank 2 (Left Side)Exhaust.Install the left intake and exhaust camshaft position sensors. Refer toCamshaft Position Sensor Replacement - Bank 2 (Left Side) IntakeandCamshaft Position Sensor Replacement - Bank 2 (Left Side) Exhaust.Install the left camshaft cover. Refer toCamshaft Cover Replacement - Left Side.Install the intake manifold. Refer toIntake Manifold Replacement.